In an attempt to address environment related issues in the city, a group of like minded individuals form various walks of life have come together to form a team called Green Saviours. They have commenced work on their first project called VENUGREEN. The Venugreen Project in its first phase will take up planting of trees on various campuses that include educational institutions, offices of social and governmental organizations, commercial and industrial establishments and even compounds of houses of individuals, residential buildings and parks. The plan is to plant trees that are native to Belagavi. Subsequently they will undertake the plantation of trees along roads. 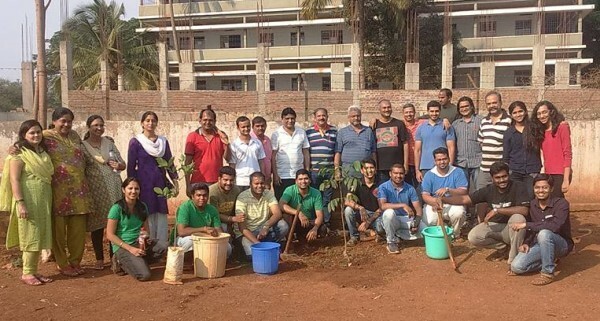 In their first commitment to plantation, the team planted 15 trees on the campus of Bharatesh group of institutions near Fort, Belagavi. Thirty members participated in the activity that was conducted early morning on Sunday, 10th April 2016. The group procured trees from the local forest nursery and the DFO helped them with the procurement of saplings of Rain tree, Mahogany, Neem and Champaka trees. The forest department has promised all possible help.The second plantation drive has been planned for the next Sunday at 7.30 AM at the Gurudev Mandir campus at Hindwadi. The group wishes to extend an invitation to volunteers from the city who wish to join the project. To join the initiative, contact 09611313919. Lets work together on a Green and Clean Belagavi.